In addition to our popular Business Card Templates and A6 Flyer Templates we also offer A5 Leaflet Templates. These are professionally designed leaflets covering a range of professions that you can customise online. We also offer Generic Templates that suit many business sectors. You can add your own text, upload pictures and all at no extra cost. Simply customise your leaflet online, check your online proof and order the quantity your require. We offer 4 service levels including Next Day Delivery so you could have your professional looking leaflets sooner than you think! Call us on 01582 410741 as we may still be able to dispatch today. Order by 1pm (Mon-Fri) for same day dispatch. Using personalised A5 folded cards is an effective and memorable way of connecting with family and friends for life's special occasions. Designing your own full colour custom A5 folded cards is an affordable way to make cards with a special touch that are as individual as you are. The digital litho printed cards from quadrantprint.co.uk produce high quality A5 folded cards and we can print orders as small as 10 cards. The A5 folded cards from quadrantprint.co.uk are printed on 350gsm smooth white card and are creased for ease of folding. Our cards are packed flat for delivery to ensure that they arrive in perfect condition and for a small amount, we can also include envelopes so that everything that you need is delivered to your door. 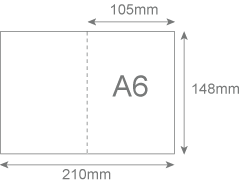 The digital printing process also makes it possible to print your A5 folded cards almost immediately, and for order placed before 1pm, your cards will be delivered free to all mainland UK addresses on the next working day. The ordering process is as simple as uploading your own artwork and choosing the number of cards that you want to have printed. Artwork can be uploaded in a variety of common image file formats to make it easy to use your own pictures or graphic designs. Ordering full colour custom A5 folded cards at quadrantprint.co.uk doesn't require any special computer skills and can usually be done in only a few minutes. Using custom A5 folded cards is a great way to create really memorable invitations, Christmas cards, or advertising material; with prices starting as low as 32p per card, it is very affordable as well. The digital printing from quadrantprint.co.uk produces high quality cards that will show off your designs, and the large sized A5 folded cards will stand out from the rest. Designing your own large sized A5 greetings cards is a great way to share a more personal message with your friends and family for holidays or your special occasions. 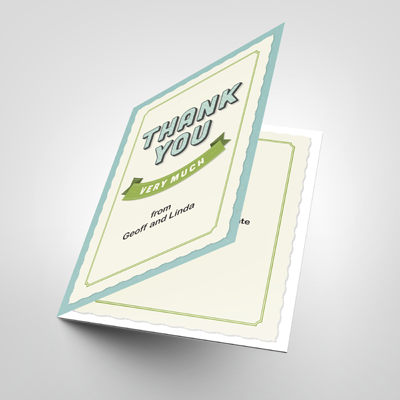 The full colour greetings cards from quadrantprint.co.uk are easy to order and our digital printing process produces high quality cards that will make a real impression. Using your family photos or corporate images to create individual A5 greetings cards will make you stand out, while the affordably priced cards from quadrantprint.co.uk costs less than many commercial greetings cards on the market. The full colour A5 greetings cards from quadrantprint.co.uk are printed on 350gsm smooth white card to produce professionally printed greetings cards with high quality printing. Artwork can be uploaded in many of the most commonly used image file formats, making it just as easy to use your family photos as it is to use professional graphic designs to create unique and memorable A5 greetings cards. To place your order is simple enough for anyone to do and can usually be completed in a few minutes, with just a few clicks. For orders placed before 1pm, our A5 greetings cards are delivered free to all mainland UK addresses on the next working day. The A5 greetings cards from quadrantprint.co.uk are creased to make folding easier and they are packed flat for delivery to make sure that they arrive in perfect condition every time. For a small amount, you can also order A5 envelopes to be delivered with your A5 greetings cards so that everything that you need to send the cards comes together. From only 32p per card, full colour customised A5 greetings cards from quadrantprint.co.uk are not only a unique and personal way to share your celebrations and holiday greetings, but they are also one of the most affordable.